Independent energy firms Good Energy and Ecotricity have topped the 2014 Which? energy company customer satisfaction survey, beating off competition from major players such as British Gas, EDF Energy, Eon, Npower, Scottish Power and SSE. We surveyed more than 8,500 members of the public to reveal 2014’s winners and losers. You can see the full results for all 17 suppliers rated on our best and worst energy companies page. One of the main reasons people say they don’t switch energy provider is because they think all providers are the same. But the difference in the customer scores in our survey shows this is not entirely the case. While Good Energy and Ecotricity emerge jointly victorious with a table-topping 82%, the major brands have a long way to go when it comes to keeping their customers happy. Npower came bottom, picking up just 31%. Good Energy is a small independent supplier providing energy generated by renewables, such as wind, solar, hydro and wave power, to about 35,000 customers. It might not be the cheapest provider, but it’s freezing its prices until at least 31 March 2014. And before that, it has increased electricity prices only once in the last four years. Similarly Ecotricity has promised to freeze its prices until April 2014. It has about 80,000 customers and, like Good Energy, is the only firm to score five stars in each category in our survey. Ecotricity prides itself in having the lowest number of complaints received per thousand customers compared with most energy providers. Ecotricity says that it invests about £280 per customer per year in building new sources of green energy. This year, for the first time, enough customers have responded to our survey for Spark Energy and Utilita to be included among our results. Utilita, which specialises in prepayment customers, achieves seventh place, while Spark Energy – which has been offering some of the most competitive deals on the market in recent months – scores only 48%, with poor ratings for customer service and how it deals with complaints. Both companies score five stars for value for money. Despite dominating the market, the ‘big six’ energy suppliers (British Gas, EDF Energy, Eon, Npower, SSE and Scottish Power) have all ended up in the bottom of our results table. 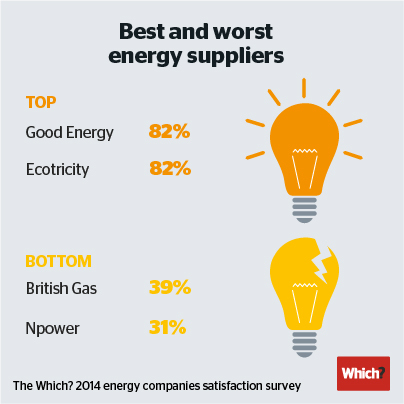 Out of the big six energy suppliers, Eon scored the highest customer score of 45%, while Npower came last with just 31%. Npower received the worst customer score overall. It scored just one star in three categories, including value for money, how it deals with complaints and how it helps its customers save energy. If you’re unhappy with your energy supplier, compare gas and electricity suppliers with Which? Switch to see if you can find a better deal. Our survey also includes providers in Northern Ireland. The electricity market in Northern Ireland only opened up to competition in 2010 and is regulated. Four electricity suppliers currently compete for customers and our survey reveals ratings for three of them: Budget Energy, Airtricity and Power NI. Find out their scores in our energy companies reviewed pages. How to save on your energy bills? Get free advice from Which?